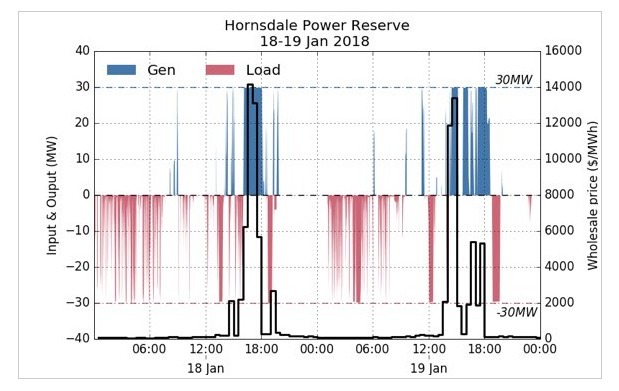 Tesla surprised the world by completing the largest-ever 100MW Powerpack project in just under 100 days in South Australia to help support its volatile electricity market. It became operational in December last year, demonstrating the might of this source of clean energy. And it now seems that the automaker’s project to power South Australia is paying off quite well. But, we’ve now received inklings of the financial worth of this massive battery project, which is formally known as Hornsdale Power Reserve and it’s looking bright for the owners. According to the latest report by Renew Economy, Tesla’s Powerpack battery system may have earned its operational owners, Neoen a total profit of around 1 million AUD (approx $800,000 USD) over the course of just two days when it was operational. In addition, to tell you more about the Powerpack battery system, it may have been built by Telsa but is operated by local giant Neoen as part of their wind farms. The capacity of the same has been divided into two levels. Neoen has access to around 30 MW/ 90 MWh of the overall capacity of the battery system for the wholesale market whereas the remaining 70MW/39MWh is reserved for the government. The latter comes handy in the stabilization of power grids across the country. In the previous year, Tesla’s huge battery system took mere milliseconds to get into action, keeping the electricity grid running, when a coal plant crashed out of the blue. This has proven that the Powerpack system (and clean energy resources as a whole) can be quite beneficial and replace the traditional forms of energy production in the current scenario. So, it is obvious that Elon Musk’s bet to curb electricity issues in South Australia is paying off well for both parties. This is only the beginning and we’ll hear more praise of the Powerpack systems in the coming months. Isn’t it quite impressive what solar energy and its storage can do for a country? Let us know your views in the comments below.